When I wrote last year that MTN Nigeria had made a profit of more than $28 billion since it started operations in Nigeria, many in the community said it was impossible. That piece and the associated video are here. From 2003 to all the missing years, we estimate a profit of N600 billion. This was also a good period of unprecedented profitability for Glo. It was founded in 2003 which was early enough for some of the nuclear profits in the sector. Largely, with publicly available data, you can extract the profit and revenue of many private telecom companies in Nigeria. In NITDA, they have to pay 1% of profit. All you need is how much NITDA reported it received from that firm. Do the same with ITF, you will model what was happening without cracking your head. On the $8.1B CBN refund request from MTN, the telecom giant has responded. 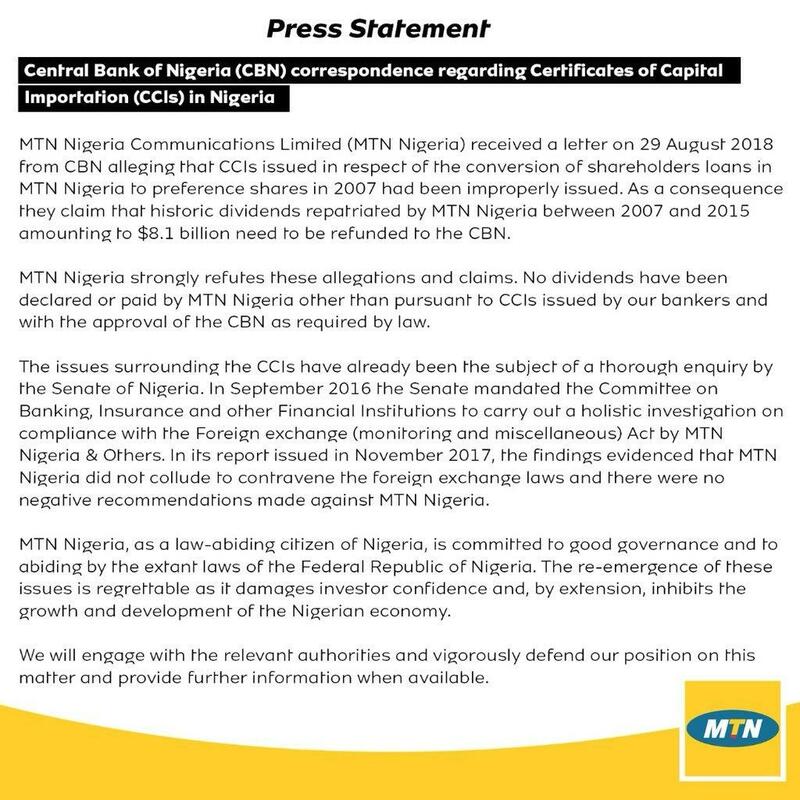 In that response, it dropped a BIG hint: “As a consequence they claim that historic dividends repatriated by MTN Nigeria between 2007 and 2015 amounting to $8.1 billion need to be refunded to the CBN”. Tomorrow, one crazy person will tell you that it is hopeless to start a business in Nigeria. Yes, MTN Nigeria wired out $8.1B as dividend out of Nigeria within 7 years. It might have paid some of its investors within Nigeria. The possibility is that it might have paid more than $12 billion within that period as dividends. I had modelled about N1.9 trillion profit within this period (refer above); if you divide that by N157 to $1 which I had used in the original analysis for the same timeframe, you would arrive at this $12 billion. The key to this model is the NITDA public data which I extracted. The Act establishing NITDA mandates that telecommunications companies in Nigeria are required to pay 1% of their annual profits as levy for NITDEV. According to Dr. Pantami, the only operator that has been consistent in paying the levy is MTN. Yet, by 2007, MTN was not “making money” because competition and per-second billing had arrived. Glo crashed the party bringing per-second billing. In my model, MTN made more money in its first four years of operations than its last 12 years. This is FREE market and a confirmation that Nigeria is not that hopeless. MTN Nigeria continues to make a case that Nigeria is a great place to do business. I just hope that government is fair and balanced in all the issues it is throwing to the company. Yet, there is no reason government should not be.